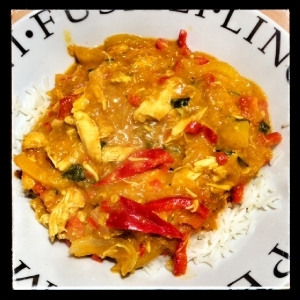 My friend made a gorgeous curry for me one night while I was at uni (feels like a lifetime ago now!!) and when I later asked for the recipe,she couldn’t find it! The only thing she could remember were the spices that were in it. It was so nice that I fiddled about for a while and came up with my own version of the recipe and it was even better!! The OH loves it as its both spicy and saucy and I love it even more because it’s so low in points. You can use either raw chicken breast breasts or do what I did last night and roast a chicken and use the cooked breast meat (I then keep the remaining chicken for using in salads and lunches through the week). If you are using leftovers just add the chicken to the sauce when you put the rice on to cook. 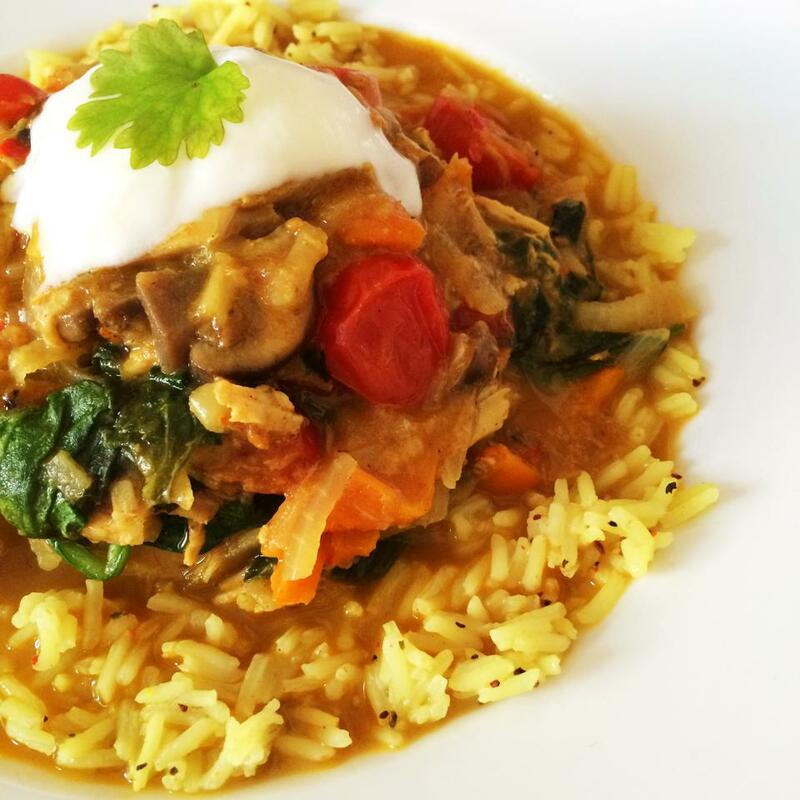 I’ve also made this curry a few times with lamb (remember to adjust the points) and I leave it to simmer on low for a couple of hours, pop some chopped spinach in 5 minutes before serving and its also GORGEOUS! I serve the curry with 60g of rice per person and add a little chicken stock water and my new discovery, ¼ tsp Schwartz Pilau Seasoning whilst the rice is cooking (0pp) for extra flavour!! This makes the meal 9sp in total. (if making for two I would half the amount of meat to 200g but make the sauce for 4 so you get the lovely flavours of all the spices. This would make the curry 4sp in total). Fry your diced onions in 1kal and a little water for around 5 minutes. Add the ginger, garlic and chilli and cook for another minute and then continue to cook mixture until onions are nice and soft (but not brown). Add the turmeric, cumin, ground coriander, chilli powder and curry powder, sprinkle with water and cook for another five minutes. Add half the flour and cooking for another minute. Pop the mixture and water into a blender and blitz until smooth. In the same frying pan, season and fry your chicken until cooked through and then remove from the pan. Then fry the sliced onions for five minutes and then add the peppers, mushrooms and tomatoes and cook for another few minutes. Add the rest of the flour, fry for a minute and then pour the sauce mixture back into pan over the veg and simmer for five minutes. Then add half the stock and continue to simmer adding the stock as and when needed (I used all of it) for around 10 minutes. The mixture should thicken up as it summers so use the stock to achieve the consistency of sauce you prefer. At this point pop your rice on. I added a little of the chicken stock and my new discovery, Shwartz Pilau seasoning, into the rice water for a bit of extra flavour. Once the rice is bubbling again, tip your cooked chicken into the curry sauce and stir in. Five minutes before your rice is cooked throw the spinach, fresh coriander and yoghurt into the sauce and simmer for a final few minutes. Serve the rice, topped with the curry sauce and finish with a dollop of natural yoghurt and a fresh coriander. Made this for dinner tonight. Delicious will definitely be making it again. Laura how many points is this on flex? Only found your site a couple of days ago via the weightwatchers flex Facebook page. Cooked this tonight it’s delicious. Tomorrow doing the salt& pepper chicken. Can’t wait.